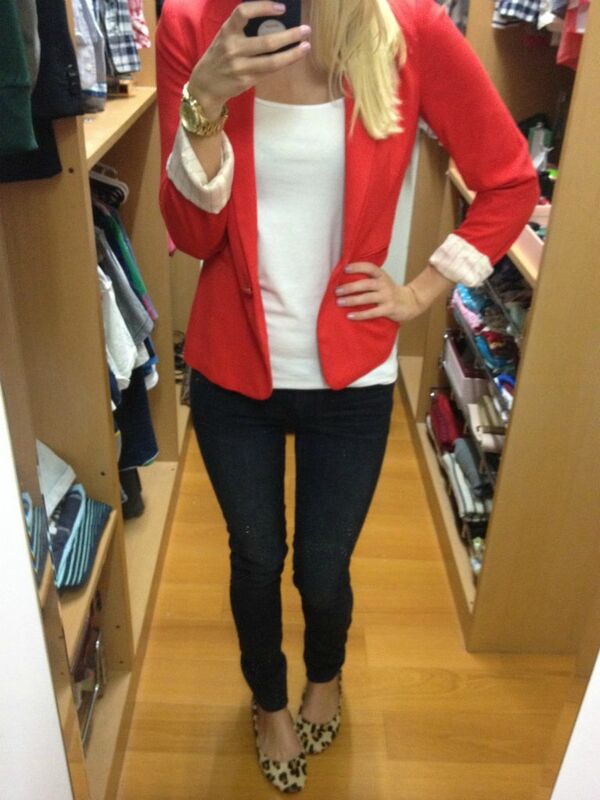 Who doesn't love blazers for fall and winter? If I could, I'd buy one in every color imaginable. For someone like me who likes to wear a plain white shirt and jeans or black leggings, adding a blazer instantly spruces up an otherwise mundane outfit. I also love the versatility of a blazer. When the weather is still nice in the fall time, you can just roll up the sleeves, and wear it over something thin and cool and even shorts. And as the weather gets colder, just roll down those sleeves, add some layers underneath it, and voila! I adore this blazer. I think the color would be very flattering on anyone, no matter your hair or skin color. It has big gold buttons on the front and the cut is very different from my other blazers. This might just be my favorite one out of the bunch. I really love that this blazer has the shoulder thing going on, it brings something different to the silhouette. The sleeves have small gold buttons at the end, which makes it a little hard to roll up, but it's not impossible, it might just be a little chunky. Also, rolled down, the sleeves are quite long on me, so I'll have to make a quick trip to the seamstress soon. The fabric is quite soft, definitely not the usual blazer material. This makes the blazer very light and super comfortable. This will be a nice blazer for the colder months, as it's definitely warmer than the others. I'll probably also dress this one up with a chunky warm scarf as well. Do you like blazers? Which colors do you have/want? Gorgeous blazers, I'm jealous! I can wait to go out and do some shopping!! Very pretty Liesl, didnt know you had so many blazers!!!!!! Dankie, Mamma! Ja... oops.. haha!